This Brut Nature has no residual sugar so the finis is delightfully dry. This limited edition cuvee is fruit forward and elegant. 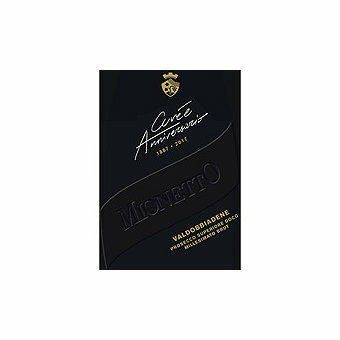 To Celebrate their 130th Anniversary, Mionetto created this luxury cuvee Prosecco. Founded in 1887 by Francesco Mionetto in the small village of Valdobbiadene, Mionetto has an established reputation for quality, tradition and innovation. In the heart of the Prosecco region, Mionetto produces exceptional wines with consistent national and international acclaim. To make this refined Brut Nature sparkling wine, the fruit of Mionettos lengthy winemaking expertise, the white grapes are gently pressed and the must immediately fermented; the wine then receives its secondary fermentation following the Charmat method during which the wine rests on the lees for 3-4 months adding texture and complexity. This limited edition cuvee is fruit forward and elegant. True to the grapes character it shows intense notes of apple and citrus fruits. This Brut Nature has no residual sugar so the finish is delightfully dry.